Frances Brody’s seventh and newest Kate Shackleton mystery (in the US) has such an intriguing premise, and the way the storyline plays out is completely absorbing. This is the seventh book in the series – I’ve read four – and the best so far. I loved pretty much everything about it, from the quaint English village setting with all of its interpersonal tensions, to the well-developed characterizations of both adults and children, to the pacing – which is leisurely enough to reflect rural life in the Yorkshire Dales in the mid-1920s, but with sufficient activity that the novel is never dull. And, as in the previous entries, Kate’s subtly sarcastic observations on life, and especially on the eccentricities of the people she interacts with, are wonderful. Everything about the book works well in unison. Kate, a private investigator by profession, has arrived in Langcliffe to spend two weeks with her adolescent niece, Harriet, who’s recovering from diphtheria. Her beau, Dr. Lucian Simonson, arranges for them to stay in the house formerly owned by his late Aunt Freda. Before she passed on, Freda had wanted to meet Kate, not only because Lucian spoke highly of her, but because she’d hoped Kate would clear the name of a man she believes was put to death unjustly a decade earlier. Late one night, from an upper-storey window, Freda had seen the murder of the owner of the pub across the street. She was the only witness. It was politically convenient to blame an Irishman who’d had too much to drink, but Freda knew he wasn’t guilty. Her testimony for the defense had caused some folks to ostracize her. Kate’s reputation has preceded her. Because she is who she is – curious, determined and tenacious – Kate finds herself quietly looking into this case as well as two others. One involves finding a mill girl’s younger brother, who’d ran away from the farm where he’d worked (for good reason). The third is a surprising request to retrieve some love letters from a long-ago affair. Needless to say, Kate’s supposed holiday is more eventful than expected, but Harriet – delightfully so – enjoys following in her aunt’s footsteps. (Harriet had been introduced to series fans earlier, in Murder in the Afternoon, but this volume stands alone nicely.) Period atmosphere is blended in well. Telephones are still too new for everyone to own one, and Kate’s motorcar generates excitement since motor travel is still a novelty, especially for kids. What gets neglected is Kate’s relationship with Lucian, but then there isn’t much romantic tension between them anyway. A war widow, Kate’s too independent to settle for anything less than the perfect partner. I couldn’t help but wish she’d find happiness with Lucian, but (I have to admit) that’s partly because Freda’s house is a lovely place to stay. As a reader, I reveled in the time I spent there. I just wish Kate could have met Aunt Freda, since I think they would have gotten along famously. For readers who enjoy sagas or historical novels about long-buried secrets but don’t think they enjoy crime novels, this book would be a great choice as “gateway” to the historical mystery subgenre. 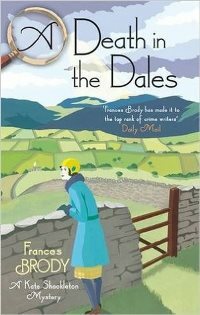 A Death in the Dales was published by Minotaur in February (thanks to the publisher for sending an ARC).